Cow is known as Pashu, Gai and in many other names in India and is worshipped and venerated like the Himalayas and the Ganga. When my son was five years old - he asked me one day, why the Hindus were not allowed to eat a cow and what was the reason behind that? It set me thinking ..... for I, unfortunately belonged to a generation that accepted things that were told to us - never questioning our elders. Yes - I pondered - what could be the reason that Hinduism disallowed cow eating and more than that, simply venerated and held the cows- sacred? 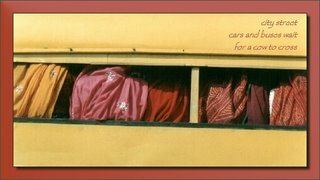 Mata pita guru dhaivam . . . Which roughly means that. . .
and finally Dhaivam - the supreme God. That was the order of importance! India is a land that gives great importance to the position of motherhood. And the Cow gives us milk - so she is regarded as a mother . . .
Can one eat one's own mother? This simple logic holds good even today- though sadly, now-a-days, many Hindus eat beef. . . which is besides the point. summer morning . . .
Nearly 13 years back when we were driving down to Chennai from Pune - on the way near Bangalore, we saw hundreds of cows, with each cow's hind legs tied together being taken on the roads - we stopped to ask why they were tied and where were they being taken to ? The villagers replied that there was a great scarcity of water in that area that year and that these cows had no milk and that these villagers had no other option left but to give it away to the butcher. . .
"Among cows I am the wish fulfilling cow." 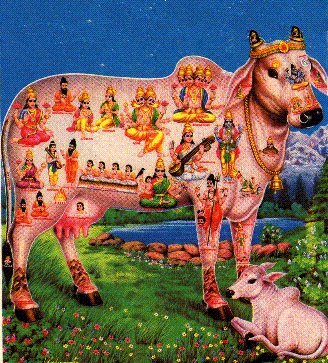 The surabhi cow descended from the spiritual worlds and manifested herself in the heavenly spheres from the aroma of celestial nectar for the benefit of all created beings. The direct descendants of the surabhi cows are the sacred cows from the continent India which are uniquely distinguished the same as the surabhi by the beautiful hump on their backs and the wonderfully soft folds of skin under their necks. Since all cows in existence in the world today are factual descendants of the sacred cows of India they are all holy as well and should always be lovingly cared for and protected with the highest esteem and greatest respect. One should never cause harm to cows in any way even in a dream and one should never ever even think of eating the flesh of cows as there is no action more sinful in all of creation then cow killing. Cows are the mothers of all creatures. 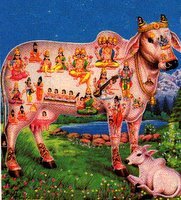 Cows are verily the mothers of the 33 crores of demigods that administrate creation in the material existence throughout all the universes. Cows are the goddesses of the gods and the refuge of all auspiciousness. Cows bestow every kind of happiness and for these reason they always are worshippable. Cows are the support of all the worlds for by their milk they nourish terrestrials beings and by their ghee offered in sacrifice they nourish the denziens of the celestial realms. A cow must never be given to a tiller of soil. Only a bovine bull may be given to a tiller of soil but never a cow. which Shiva rides, and the leader of the Ganas. The white color of the bull symbolizes purity and justice. Shiva and Nandi's association in Hindu scriptures and art can be traced to the Indus Valley Civilization, where dairy farming was the most important occupations, thus explaining the appearance of various artifacts indicating a deity much like Shiva. This deity is believed to have been worshipped as the keeper of herds, and over time, was converted into the present day Shiva, with the bull Nandi as his primary vehicle. Over time of course, Nandi was accorded the position of a lesser Hindu god and a number of temples are dedicated solely to Nandi. The close association of Shiva and Nandi explains the presence of a statue of Nandi at the gate of the Garbha Griha (sanctum sanctorum) of every mandir dedicated to Shiva. It also explains why the word "nandi" in the Tamil language is used as a metaphor for a person blocking the way. In Sanskrit, a bull is called "vrisha", which has another connotation - that of righteousness or Dharma. In Hindu mythology, it was Nandi who cursed Ravana (the demon King of Lanka) that his kingdom would be burnt by a monkey (Vanara). And later Hanuman burnt Lanka when he went in search of Sita, who was kept prisoner by Ravana in Ashok Vatika. In addition to being his mount, Nandi is Shiva's foremost disciple. As the foremost disciple of Lord Shiva, it is important to seek the blessings of Nandi before proceeding to worship Lord Shiva. When the positive forces, the devas, and the negative forces, the asuras, joined together on a rare occasion to churn the mountain to obtain the nectar of immortality they utilized Vasuki, the serpent, as the rope. The devas pulled from one end and the asuras from the other. Vasuki was upset during the process of this churning, and vomited up a poison which became human karma. This "poison" was so dangerous that none of the devas or asuras wanted to go near it. It was extremely sticky and coming into contact with this poison, i.e, human karma, would drag the divinity down to the realms of human suffering and ego. As everyone else ran away, Lord Shiva, followed by Nandi, came forward to help as he was the only one who could counteract this deadly poison. Shiva took the poison into his hand and drank it. Nandi saw some of the poison spill out of Shiva's mouth and immediately drank if off the ground. The devas and asuras watching were shocked and wondered aloud what would happen to Nandi. Lord Shiva calmed their fears saying, "Nandi has surrendered into me so completely that he has all my powers and my protection". In the Natha/Siddhar tradition, Nandi is the one of the primal gurus. He was the guru to Siddhar Thirumulanathar, Patanjalinathar and others. Other sources say it was a white water buffalo. Bhagavad Gita , a non-seasonal topic for India haiku. Whilst we sit at the riverside in Benares, watching the cow (and a few other things) slowly pass by, a boy from the nearby chai shop scoops some water from the river, prepares a cup of tea and offers it to us. "First published Simply Haiku 2004"
or I wouldn't be here ~ "
I am God's breath "
Wow Gabi! This is amazing info about cows!!! Thank you so much from the cow lover on the island in Okayama....Moooooooooooooooooo! In The Netherlands, we use the expression "heilige koe" ['holy cow'] but instead of referring to the animal, it refers to ... the CAR! You see, road tax is one of the government's sources of income. At the same time, because the Dutch economy relies heavily on the transport sector, no one dares raise this tax too much, which is why it is called "holy". In other words, "Hands off the road tax!". This is, of course, aside from the fact that the dairy industry is one of the country's main sources of capital.